One of the best things about summer in Minnesota is outdoor theater and music. A few weeks ago I saw Classical Actors Ensemble's charming and playful Two Gentleman of Verona at Lake of the Isles, and last night I continued my outdoor theater pursuit with The Daughter of the Regiment by Mill City Summer Opera. This is my first time seeing seeing them, but it's only their 4th season so I don't feel too bad about that. Now, when I think of outdoor theater or opera, I picture it as a little more casual, a little more informal. 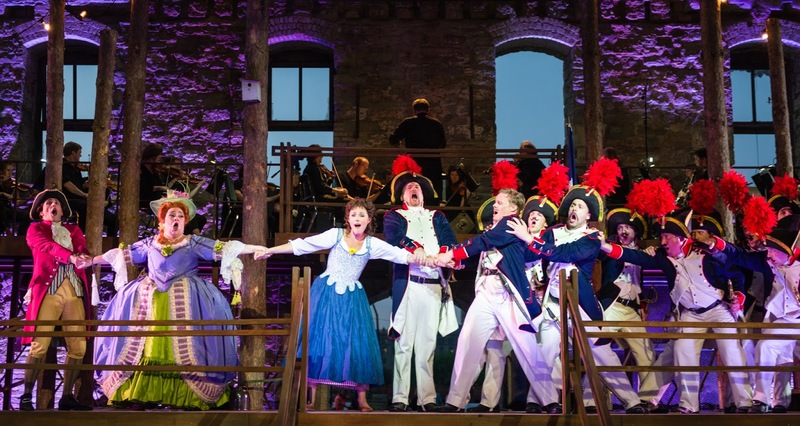 But this is a full-out opera, with orchestra, sets, costumes, and a huge cast, that just happens to be performed in the starkly beautiful Ruins Courtyard behind the Mill City Museum. I'm not an opera aficionado, but I was truly impressed by the quality of this production. And this piece is a perfect choice for summer opera - a light and silly romantic comedy. I'd tell you to go see it for a perfect Minnesota summer evening (after a lovely dinner at one of the many area restaurants, including my favorite Spoonriver) but the remaining three performances are sold out. I did see a sign for rush tickets so you might have some luck with that, otherwise mark your calendars to get your tickets early for next year's show. 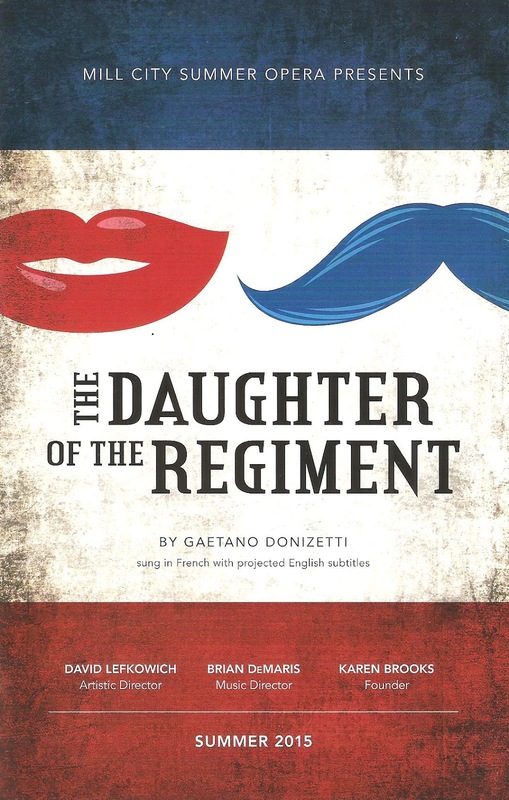 I'm not sure why Italian composer Gaetano Donizetti wrote an opera set in the Tyrolean Mountains (now a part of Austria) in which everyone sings in French, but he did. It makes sense for the French regiment (this is during the Napoleanic Wars), but it's a little odd to see these Austrian mountain peasants in dirndls, lederhosen, and alpine hats singing about the terrors of the French army... in French. But whatever, it sounds pretty. And all of the dialogue (of which there's not much) has been translated into English, which I found helpful (there are, of course, surtitles on a screen hanging above the action to translate the French libretto). The plot reads a little like a soap opera, in which an abandoned baby girl was raised by a regiment, only to be reunited with her wealthy and stuffy family years later. 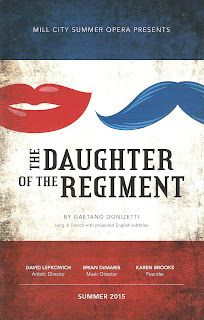 They want her to marry a duke rather than the poor peasant soldier she loves, but this is one of those happily-ever-after operas (as opposed to the operas where everyone dies), so the lovers are reunited. The plot is pretty much an excuse for some beautiful and varied music, from rousing battle songs to lovely ballads. As the titular daughter, Leah Partridge is absolutely radiant, performing the role of this rebellious tomboy with such spirit and grace. Chad Johnson performs the role of her lover with a Billy Magnussen-esque boyish charm. Rounding out the trio is Nathan Stark as the regiment's Sergeant, with great chemistry with both of the above. Cindy Sadler is also great as the pampered and flounced Marquise. Local favorite Bradley Greenwald (who can do pretty much everything - straight plays, musicals, operas, comedy, drama, foreign languages, one man shows, writing a new musical adaptation of Cyrano de Bergerac from the original French) is a hoot and a half as the servant Hortensius, milking every moment and making jokes about "ruins" with a knowing wink to the audience. He introduces party guests with a series of ever more ridiculous names (my favorite - Baron Fahrvergnugen von Volkswagen). I only wish his character had more than a few lines to sing solo, because his voice is incomparable. Another local favorite, Claudia Wilkins, makes a brief cameo as the prospective groom's proud aunt. One of my favorite parts of this experiences is that there is not a microphone or a speaker in sight. Maybe they were there and well hidden, but it's a rare treat to hear the music flowing directly from the instruments and singers to the audience's ears, unfiltered by anything but the heavy Minnesota summer air. Speaking of which, I know it's hard to keep instruments in tune in varying environmental conditions, so kudos to conductor Brian DeMaris and his 30+ piece orchestra for playing outside in all kinds of weather and sounding spot-on and beautiful through it all. The set is sparse but more than I expected. Most of the action occurs on a raised platform, with tree trunks and a rustic hut reminding us we're in the wooded hills of Tyrol. Things get fancied up a bit in the second act, when a few furniture pieces and some drapes are added to represent the castle on the mountain (set design by Jo Winiarski). Jessica Jahn's late 18th Century period costumes are gorgeous, colorful, and incredibly detailed. I don't want to think about how much the actors are sweating under all of those layers of skirts, ruffles, flounces, jackets, vests, wigs, and hats. The regiment looks sharp (see below), the Tyrolean peasants made me homesick for Salzburg (where I studied abroad), and the second act party scene is the pièce de résistance (ooh look, I spoke French!). The women's gowns are extravagant, only topped by their ridiculous headpieces (spotted - a cherry and spoon!). All of this takes place against the stunning backdrop of the ruined walls of the Washburn A Mill, leftover after a 1991 fire of the abandoned mill. A historic spot in the city of Minneapolis, built by flour mills, now remarkably turned into a space for education and great art. Outdoor music-theater in Minnesota, there's nothing better so enjoy it while it lasts! Next up - Mixed Precipitation brings operetta and delicious food tasting to a park near you!